Today was our last day of school visits and we were thrilled to have such an excellent group of students from Leeds Elementary School finish off the week! 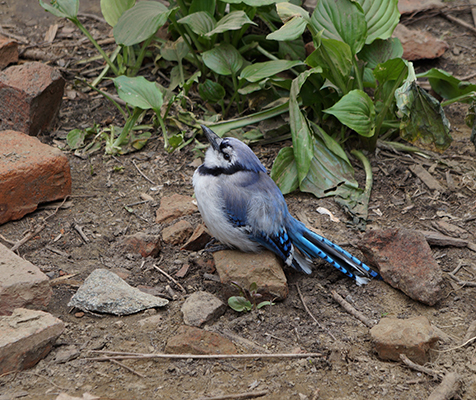 We were greeted on site this morning by a beautiful blue jay standing guard over our units in the yard. After finding him a safe new home, we had our young student archaeologists help us with more excavation and artifact processing. With Linda, students had the opportunity to open a new unit in the grass near where the door to the 1830 summer kitchen would have stood. Jill worked with students in another unit near the back wall of the house and found more charcoal and small animal bone fragments. Elena continued working with students in the area around the large granite boulders we discovered last week. Mary had the students assist with artifact cleaning in the field lab. The find of the day was an intact green glass inkwell, uncovered thanks to the help of the good eyes and eager trowels of our student visitors. This afternoon, we continued work in the yard and opened up two new units inside the house- one inside the buttery and another along the north wall of the 1790 kitchen. We look forward to seeing what we uncover here and hopefully proving the consistency of the patterns we’ve found elsewhere inside the house. We also had several returning volunteers and new visitors stop by in the afternoon to learn about the project and our findings thus far. We only have two more days of excavation so remember to stop by and see what we’re doing on Friday afternoon or Saturday during our public day! 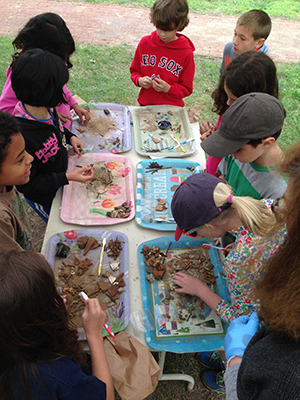 Students from Leeds Elementary School sort and dry brush excavated artifacts.